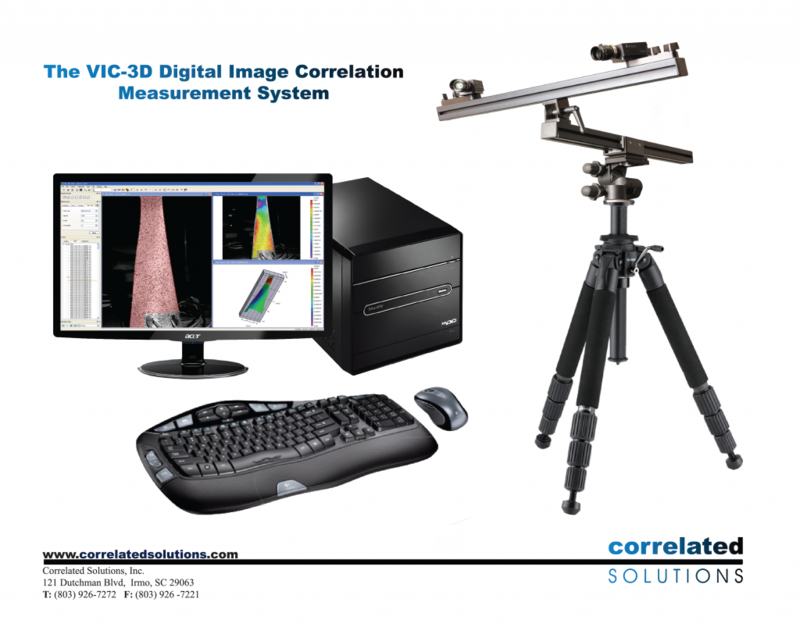 Correlated Solutions offers Non-Contact Shape And Deformation Measurement Solutions for materials and product testing. These measurements can be made on length scales ranging from microns to meters and time scales as small as nanoseconds. Correlated Solutions Inc U.S.A are recognized as world leaders and the inventors of Digital Image Correlation. 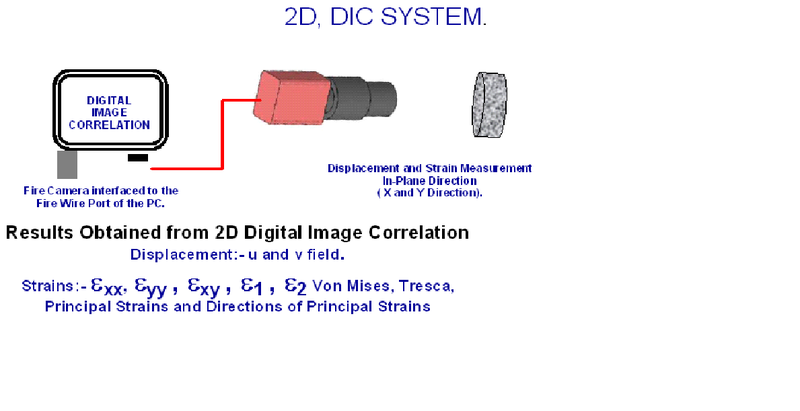 The method of 3-D DIGITAL IMAGE CORRELATION – DIC is based on principles similar to human depth perception: (Photogammetry) by viewing the same object or process from two different viewpoints, the precise shape of the object in three-dimensional space can be resolved. Position resolution in three-dimensions is accomplished by referencing a system-wide coordinate system that is established through a calibration process. 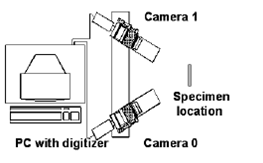 The calibration process, conducted prior to the start of each test, establishes the intrinsic camera parameters (focal distance, lens distortion factor, and sensor aspect ratio) and geometric parameters (camera positions relative to each other and to the imaged object), that control the transformation between the system-wide coordinates and the coordinates on each camera’s image plane. 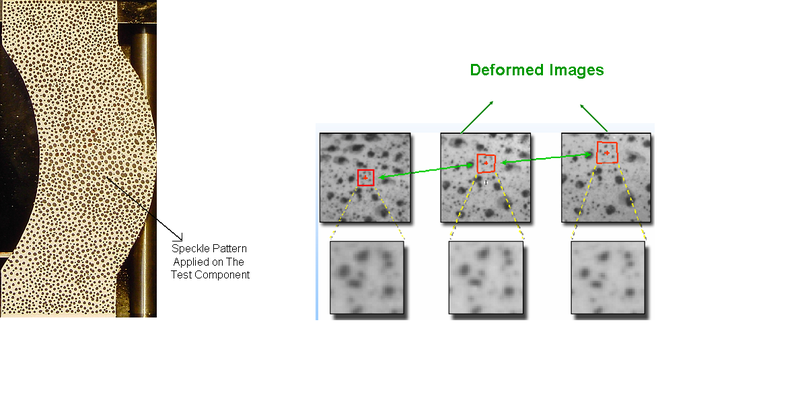 The idea behind the method is to infer the displacement of the material under test by tracking the deformation of a random speckle pattern applied to the component’s surface in digital images acquired during the loading. Mathematically, this is accomplished by finding the region in a deformed image that maximizes the normalized cross-correlation score with regard to a small subset of the image taken while no load was applied.By repeating this process for a large number of subsets, full-field deformation data can be obtained. The DIC method does not require the use of lasers and the specimen can be illuminated by means of a white-light source. However, the specimen surface must have a fairly uniform random pattern, which can either be naturally occurring or applied to the specimen before the test.Among the many methods for pattern application are self-adhesive, pre-printed patterns, stamps and application of paint speckles with air-brushes, spray cans or brushes. 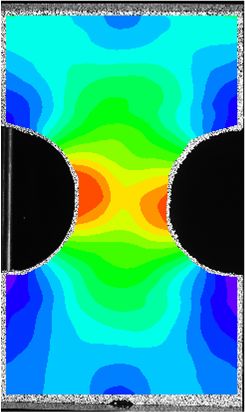 Images of the Test Component in un deformed and Deformed State are captured using 2 Firewire Cameras . The two cameras are mounted on a rigid bar to avoid relative motion of the cameras. A speckle pattern is applied on the Test Component as shown. A series of images are captured while the specimen surface is deformed (in-plane, out of plane, rotation, elongation and compression) due to loading.In each captured image, a specific pattern matching algorithm determines the shift, rotation and distortion of each point with respect to the reference image. A subset is defined as a group of pixels, usually between 20×20 and 30×30 pixels. 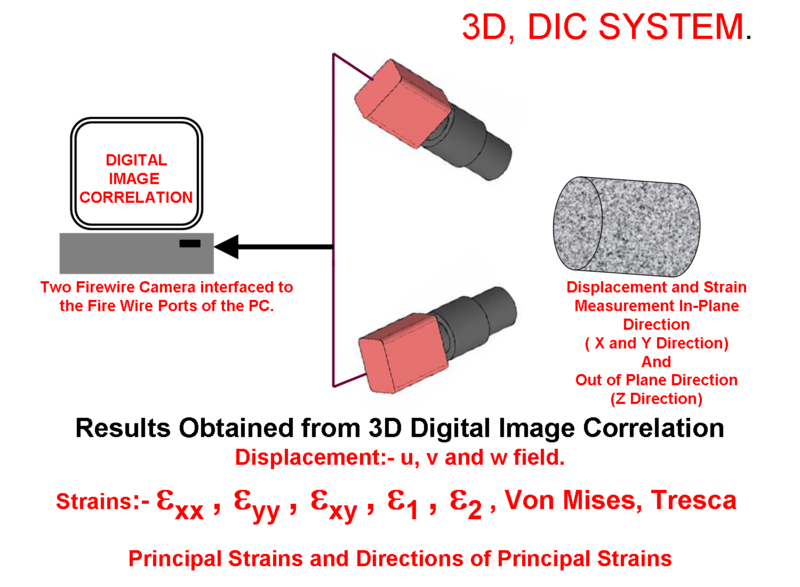 As the surface deformation is measured point wise, displacement of individual surface points and subsequently surface strains can be evaluated.